The S. Rajaratnam School of International Studies (RSIS) and the ASEAN Coordinating Centre for Humanitarian Assistance on disaster management (AHA Centre), held a policy discussion on the World Humanitarian Summit (WHS) – Implications for the Asia-Pacific in Jakarta on Monday 14 November 2016. The policy discussion brought together some 40 experts, all attending in their personal capacities. The policy discussion focused on the outcomes of the World Humanitarian Summit, the ASEAN Vision 2025 on Disaster Management, frameworks for action, stakeholder engagement and strategic priorities. The event was part of the Commemoration to Life: Journey of Partnership and Progress – Fifth anniversary of the AHA Centre in Jakarta. By examining the strengths, challenges and future of the humanitarian system in the Asia-Pacific, this volume offers insights from scholars and practitioners into the debate on reforming the humanitarian system developed at the World Humanitarian Summit in 2016 and the implications for the region. Cook, Alistair D. B. (ed. 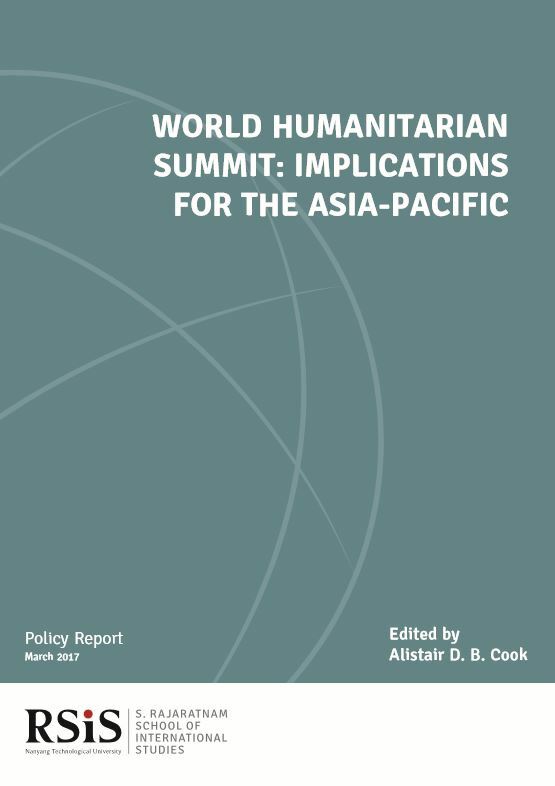 ), 2017, World Humanitarian Summit – Implications for the Asia-Pacific, Singapore: S. Rajaratnam School of International Studies.